This past week was pretty crazy so I didn't have much time to get craft, and then we went to Anchorage on Saturday for the second weekend in a row to go watch the It movie and do some shopping. Today is finally my lazy day and so I've been trying to catch up in my craft room! 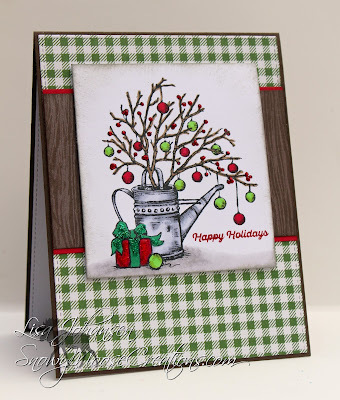 Today's card combines 2 challenges...the Hues to Use colors from Power Poppy and a tic-tac-toe challenge from Jingle Belles. 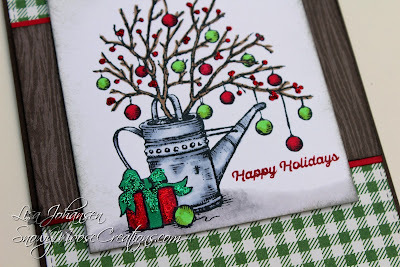 The Power Poppy colors were used as a last ode to summer on their blog but I instantly saw Christmas colors! 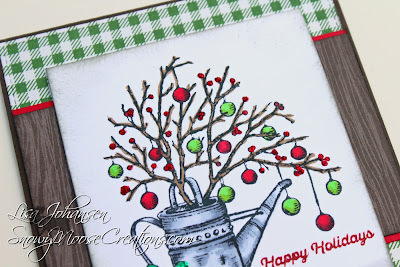 I brought the red and the lighter green from the color challenge into the ornaments hanging off the branches. 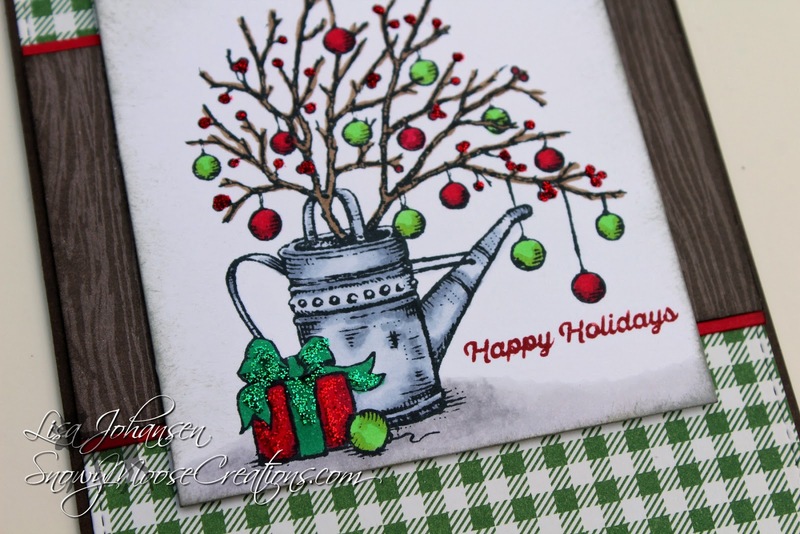 The darker green was brought in on the package and the DSP I used for the background. I used neutrals for watering can, branches and DSP. For the tic-tac-toe I went with red/card stock/bling. It's hard to see but I used Stickles on the berries on and on the package. The red isn't the main color but it's definitely on the card. 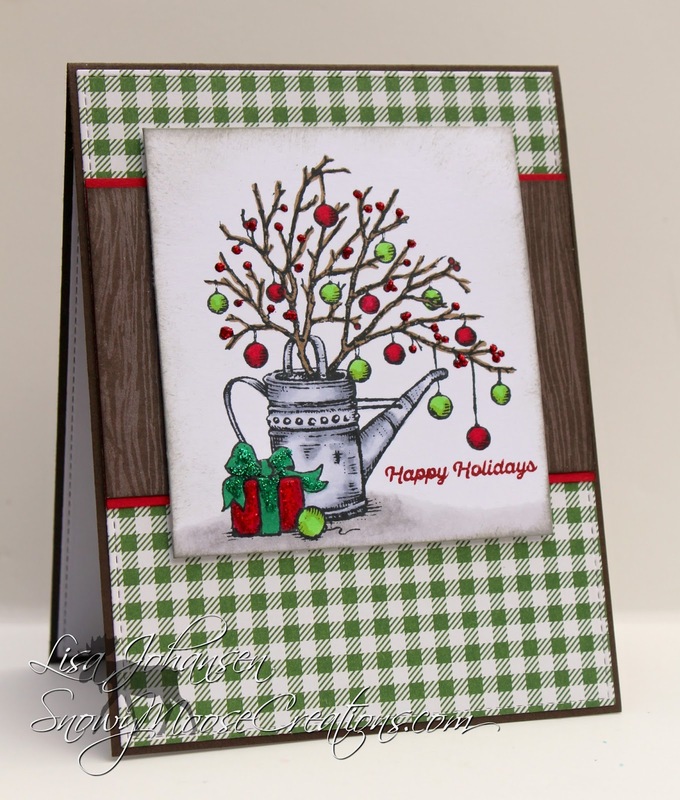 What a sweet little holiday image ... love it in traditional holiday hues ... so glad you joined our game of Tic-Tac-Toe at Jingle Belles. Gorgeous! I like the wood grain paper and these colors are classic! Wonderful card. oh wow, wow, wow! what a beautiful card! that image is definitely very appealing but of course it's the perfect coloring (that SHADOW ♥) that makes it into a knockout! 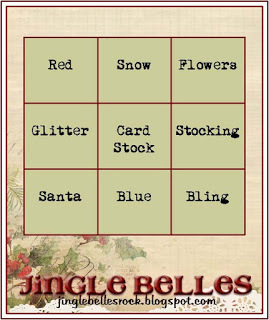 so pleased you could join our tic tac toe fun at JINGLE BELLES!